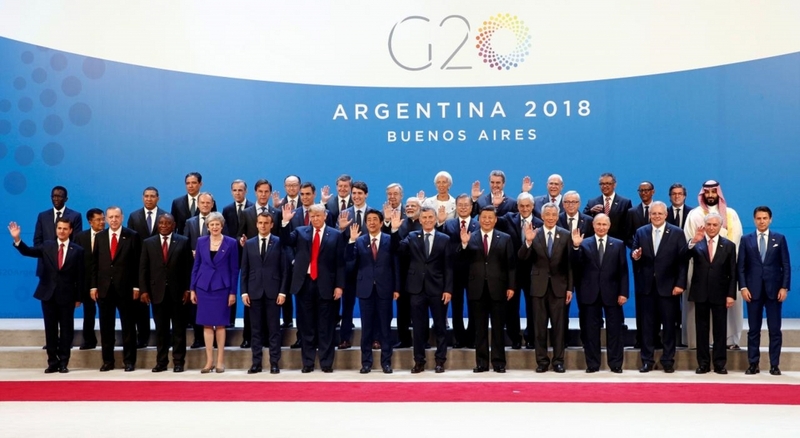 The Group of 20 (G20) summit concluded in Buenos Aires on December 1, with members endorsing the multilateral trading system, and calling for reforms to the World Trade Organization (WTO), the global trade oversight body. "International trade and investment are important engines of growth, productivity, innovation, job creation and development. We recognize the contribution that the multilateral trading system has made to that end," the G20 said in its final declaration. However, "the system is currently falling short of its objectives and there is room for improvement. We therefore support the necessary reform of the WTO to improve its functioning," members said, adding they will review progress in that direction at the next summit. In terms of climate, the G20 leaders' declaration said, "Signatories to the Paris Agreement... reaffirm that the Paris Agreement is irreversible and commit to its full implementation, reflecting common but differentiated responsibilities and respective capabilities..."
At a press conference which later concluded the summit, Argentine President Mauricio Macri summarized the declaration endorsed by all leaders at the G20 Summit and emphasized the support the international community is giving to Argentina. With respect to trade, he said that "what is being proposed is trade that is fair." About climate change, Macri said, "we agreed that every one of us has to continue addressing their commitments giving strong support to renewable energies, a sector in which Argentina is betting heavily." "The G20 is a common space for dialogue and working collaboratively," added Macri.